There be dragons in them Chiltern Hills! 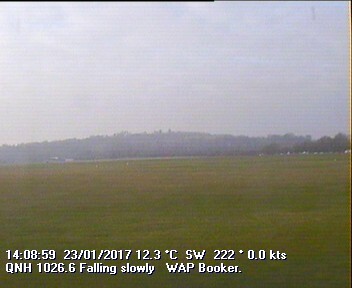 The downpours yesterday gave us a misty morning and it didn't get hot enough for a good cross country day, but there were thermals and it was possible to enjoy local soaring and some training flights. 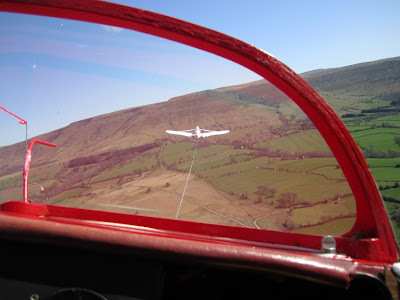 One person who was very happy with the day was 92 year old Alan, who had waited until now to mention to his family that he'd always wanted to try gliding. He was delighted with his flight and full of praise for his instructor Chris. He also said that he was impressed at how friendly and welcoming the club was. Brilliant day all round with the forecast showers holding off until the end of the day allowing several pilots to set over 300k. Generally the conditions were excellent except for the flat sky running into Norman Cross for those that were flying 320k (BOB-DID-NOR-CHV-BOO). The high cloudbase and strong climbs made up for that though. Check out the flights on the club ladder. Back at Booker the Easter Egg competition was in full flow with a very high standard of flying and high scores all round. Graham and Emily who organised the event ensured the flying and scoring were conducted to a high and safe standard. With the last aerobatic flight being conducted in front of a building CuNim and occasional lightning bolts there was a 'new' winner - Sienna Whiteside with a very creditable score of 83%. Equal 2nd place went to old competition lags Will Hilton and Alun Jenkins with 3rd place going to Guy Trees - congratulations to them and all the other competitors and hearty thanks to Graham and Emily for organising the event. The catering team of Crockett and Herman laid on another great barbecue and the day was rounded off with a couple of nice finishes. All this and the weekend isn't over yet! The very high temperatures from the week continued today and whilst several members rigged and flew there was no lack of activity and launches around the launch point. Lunch by way of a barbecue was laid on by the well known team of caterers, "Crockett and Herman" and was definitely enjoyed by all. 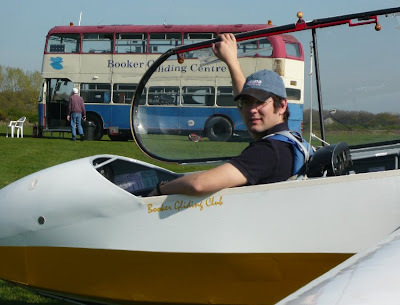 In spite of the high temperatures, Glyn's Alula hand launched glider provided a lot of entertainment for the onlookers and wore out the launching team of Oli, Will and John. The day concluded with a couple of nice finishes, don't forget the Easter Egg Aerobatic Competition on Saturday - should prove entertaining. Having decided not to rig and fly G1 Glyn takes to the air using strong arm tactics. 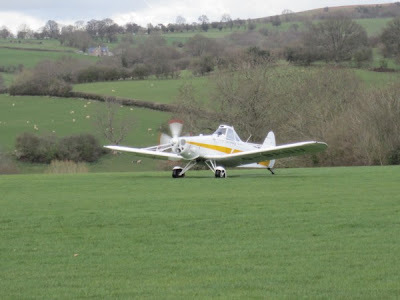 We did lots of flying, including practice for the Easter Egg Cup aerobatics comp next Saturday. There's still time to get your entry in, and it's not regarded as cheating to practise beforehand. The exuberance with which the cross country pilots returned to the airfield suggested that they'd had a good time. The pilots of the Duo Discus which ended up in a field in Frieth probably had a very good view of the finishers. Member Brian O'Sullivan says: What do you normally do between 6pm and 8pm on a weekday evening? Travel home, eat dinner, browse the web, watch telly? Living so far above the equator our lengthening daylight hours gift us time to play. As a dad with a young family but a desire to fly gliders again finding time to train is a real struggle. I've 'negotiated' Saturday mornings, but so far have missed 1 in every 2. That just isn't enough to stay current, let alone make good progress, so I've been looking for alternatives. And I think I've found it with evening flying. What perfect conditions for training! Now the experienced flyers amongst us should stop reading now... when you are trying to master the multi-dimensional skills of co-ordination, thermals are a pain in the rear end: Heresy I know, but true nonetheless. Once above about 500 feet on the aerotow something quite magical happened. The conditions were so smooth, I relaxed! With a bit of fine tuning with the trim, the stick barely needed any attention. I can't tell you what a massive confidence boost this is for a student. I however made the mistake of telling Chris this after we landed and his retort was, "Relaxing on the aerotow. I need to give you more work. Next time box the tow!". Sigh... after an early degree of success boxing the tow, an oscillation set in which I initially attributed to the tug pilot trying to fling me about the sky. Silly me... I of course say this with tongue in cheek. Chris was a very patient instructor. The evenings are great - I can't recommend them highly enough. It's as if you've reclaimed time that would otherwise be wasted. Thanks to the guys and girls who freely volunteer their time to make it happen. Hurry, hurry, places going fast! We now have 21 paid up entries to our competition. If you were holding back for a better offer now is the time to commit. Click the link on the right for more information. ........and with the temperature soaring to record levels for April, the prospects for cross country weren't good but they were ideal for instructing. Nicholas Moschi, seen below ready to launch in CFA, enjoyed his Intro course so much that he's planning to sign up for a longer course. Despite a warm and blue forecast that was not the best for soaring, Jane Moore managed one last attempt to improve her rock polishing technique around the southern bowl. She nearly learnt the hard way that those cairns are taller than they look. 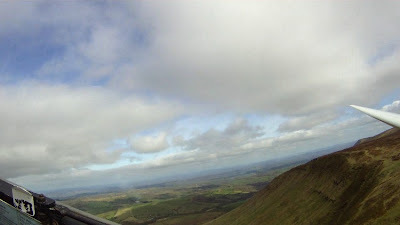 Taken from the back of the Talgarth Cabriolet K13 that went into service at the beginning of this month. For those of a less adventurous nature this run can also be practiced in the Talgarth Gliding Simulator. And finally, a preview of John's new partner and family inspecting their new acquisition. 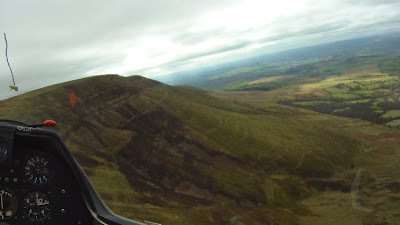 Many thanks to all at Black Mountains Gliding Club for their hospitality and for showing us how to fly next to the hard stuff. We had a fantastic week and learnt a huge amount, not least that the sound of sheep bleating is much to be preferred to helicopters. The forecast was for high pressure light winds, and the fact that the cloud soon descended onto the hill seemed to confirm this. 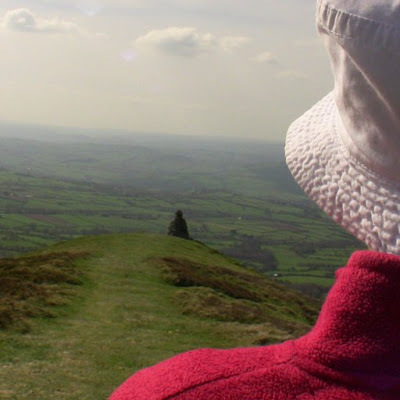 But the weather gods had plainly not read the forecast, and they produced a very nice northwesterly, so we were able to zap up and down the ridge to Hay Bluff and back. It was also possible to get across the valley to Llangorse Lake and back, so the 'boys' spent their time seeing how fast they could do the whole run. 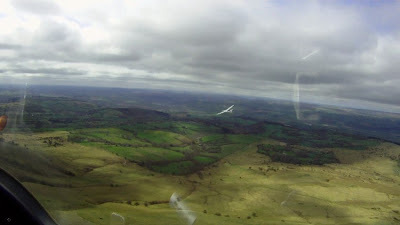 Cloudbase never got much above 2000ft but with the ridges working so well this was not a problem. No pics, it's enough to concentrate on avoiding rocks and other traffic without getting out the camera. No report yesterday, sitting in the sun reflecting on the day's flying - and waiting for William to land - seemed infinitely preferable to turning on a pc. Tuesday was a bit too breezy for flying, so the merry band sought alternative entertainment. One party went down the mine, specifically the NCB museum near Abergavenny, reportedly an excellent day out. Party 2 drove round to the foot of Hay Bluff and decided that it would be foolhardy to attempt the ascent in view of the howling gale whipping around the top. The Youth Wing (and those with aspirations) went canoeing. And they all came back, although it was in doubt at one point when Richard discovered he hadn't mastered the Eskimo Roll. Yesterday offered a bit of everything, wave and ridge and thermal, sometimes all at the same time. The early birds got into the wave and had fun exploring the system, too much fun to spend time taking pics. Jim says he got to 8653ft amsl. The rest became more acquainted with the Black Mountain ridges, and did some thermalling amidst spectacular scenery. No airborne pics, but here are a few of the gang on the ground. On Saturday a hardy band of Booker pilots headed west to Black Mountains Gliding Club to learn about ridge flying. Tug UU has come along for a holiday too. So far we have flown every day, doing check flights and getting to know the local scenery. For those of us used to flying over flat land it's a new and interesting experience. Our hosts are very friendly and welcoming, full of helpful advice. The weather on Saturday was superb, enabling flights along to Hay Bluff and down the Cwmdu valley to Crickhowell. Today we did a few more check flights, and Jim had a go before we decided that gliding was more of a spectator sport and the toys went away. This is a fantastic place to play, the scenery is magnificent, especially when viewed from close up, and it's a great opportunity to learn new skills.